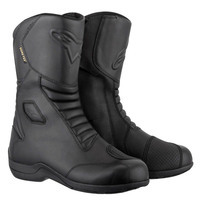 The Web Gore-Tex boot has been a “staple” in the Alpinestars boot lineup for many years. It is a great all-around style for the sport and touring rider. What makes these boots “special” is the use of Gore-Tex as the waterproofing technology (which is HIGHLY regarded), and the use of leather as the main material. We only have a few other boots that use leather like this… I instantly think of the TCX X-Five Plus Gore-Tex Boots as being an “equal” to this. Many like a leather boot rather than the man-made leathers used in the majority of motorcycle boots nowadays. Overall, the finish and quality look excellent (as always with Alpinestars). I’m impressed with the feel of the shin, heel and toe reinforcements. Those, along with the thick leather, feel like they’d hold up very well long-term. The boots have some integral padding over the inside and outside ankle bones but I can’t feel any hard plastic armor pieces there. New for this year is the CE certification. The back of the boot has a bright reflective patch for nighttime visibility. You can take the “View Larger Pictures” link above to see closeups of this boot’s features.